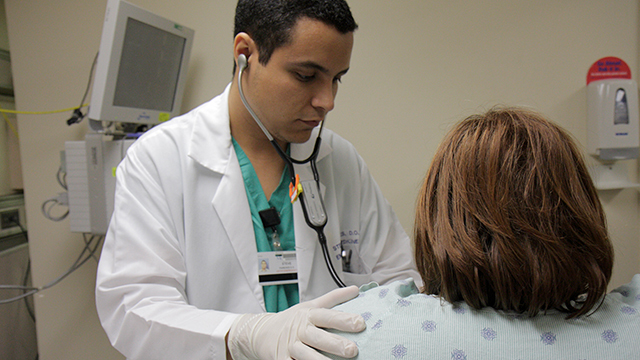 While many physicians in the United States report frustrations with their work, the public continues to hold health care providers in high regard. Nearly nine-in-ten Americans (87%) who have seen a health care provider in the past year say their concerns or descriptions of symptoms were carefully listened to, and 84% say they felt their provider “really cared about (their) health and well-being,” according to a Pew Research Center survey conducted in spring 2016. 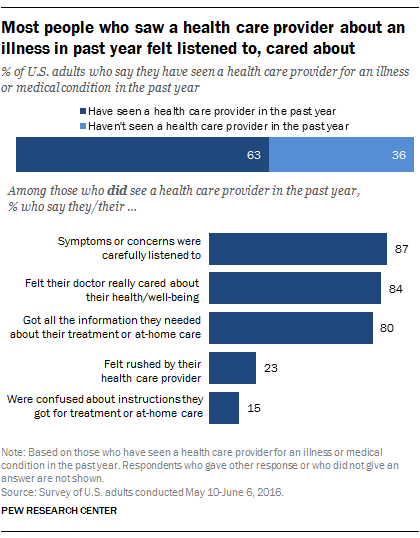 Just 23% of patients said they “felt rushed by their health care provider,” and even fewer (15%) felt confused about instructions they got for treatment or at-home care. These findings come despite a range of negative experiences reported by health care providers themselves. Professional burnout, for example, is reportedly on the rise among physicians due to long work hours and excessive administrative burdens. Pediatricians find it harder to do their jobs as they confront a growing number of parents who are hesitant to vaccinate their children. Adding to this pressure, the medical personnel at the Centers for Disease Control and Prevention have had to cope with some 750 potentially serious health threats in the past two years, even as the agency faces budget uncertainties in the year ahead. Medical professionals and other stakeholders also have been shut out of congressional deliberations about repealing and replacing the Affordable Care Act. Meanwhile, their own patients have grown more critical about the country’s health care system: A 2014 Pew Research Center survey found that just 26% of adults say U.S. health care is above average or the best in the world, down from 39% in 2009. Health care providers are not the only medical professionals who receive favorable ratings from the public. Medical scientists are likewise held in high esteem. For example, in a 2016 Pew Research Center survey, 84% of Americans expressed at least a fair amount of confidence in medical scientists to act in the best interests of the public. And a 2013 survey revealed that 66% of Americans believe doctors contribute “a lot” to the well-being of society – a higher rating than for the clergy, journalists and business executives. Moreover, although pediatricians are confronting an increasing number of vaccine-hesitant parents, the majority of the U.S. public still wants them engaged in the issue. Nearly three-quarters of U.S. adults (73%) believe that medical scientists should have a major role in policy decisions related to childhood vaccines.